Summary: Where Adblock Plus ("ABP") indiscriminately injects over 13,000 generic CSS rules into every page and frames, HTTP Switchboard ("HTTPSB") injects only a handful generic CSS rules at most. HTTPSB's approach is to perform a quick web page survey in order to dramatically narrow down the generic CSS selectors which need to be injected in web pages and frames. Examples: on wired.com ABP injects over 13,000 generic CSS selectors while HTTPSB injects only 8 generic CSS selectors; and on a page with no ads, ABP still injects over 13,000 generic CSS selectors while HTTPSB injects none. Regarding ABP memory consumption, I'm with Firefox on this. When the way to implement ABP element hiding filters is to inject a gigantic style sheet in every page (and frame), it bothers me to see the blame shifted onto Firefox. Injecting such a large number of CSS rules indiscriminately is nonsense, and this is the first thing which I thought should be addressed before asking Firefox to fix itself. This is what motivated me to actually support ABP cosmetic filters: it's easier to demonstrate that the code can be improved by actually writing it. So here it is, with version 0.9.4.0, ABP cosmetic filters are supported. The major difference with ABP implementation is that only the CSS rules which are relevant to a page are injected, which means a handful of them at most for a typical ad-driven web page, and often none at all -- as opposed to ABP which injects 20,000 CSS rules into every single web page (as per ABP developer). For example, visiting www.wired.com with matrix filtering turned off, only one single CSS rule is injected into the page by HTTPSB. Consider this feature early beta, and as of writing, the support is somewhere around 87% of all cosmetic filters (there is no performance issue or otherwise in supporting the missing filters, it's just a time thing). Note that I didn't spent that much time trying to optimize further than the primary proof-of-concept to show it is possible to improve memory consumption, and improve how fast web pages come to live (not injecting 20,000 CSS rules has a noticeable effect on how fast pages are parsed by the browser). Important: If you want to repeat the tests above, be sure that no other extensions than the one tested are enabled, as these other extensions may also add their own footprint to the web page. Also, the memory for the web page was forced-garbage-collected before the screenshots (using dev console). Note that in the test above, HTTPSB had its default out-of-the-box preset blocked hosts loaded and enabled in the matrix filtering engine, which represents an extra 60,000 filter rules, something not present in ABP. Also, HTTPSB injects two more scripts into every pages and frames as part of its normal operation, these add up too, so the memory footprint could be even (quite I suspect) lower if it wasn't for these two extra content scripts. 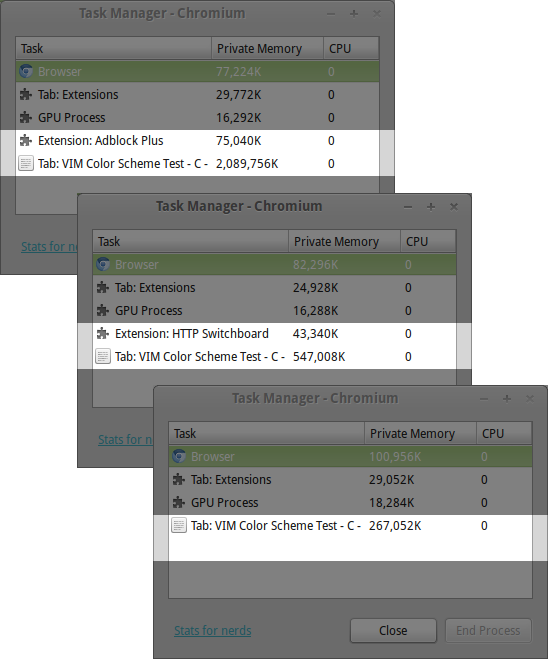 Tests for screenshots above was Chromium 34 on Linux 64-bit. Implementation (abp-hide-filters.js and contentscript-elemhide.js) is rather modular, it doesn't really depend on anything else in HTTPSB except for the utility to extract domain name from a URL, which should be easy enough to replace. Doesn't HTTPSB add a significant overhead to network traffic? How does HTTP Switchboard compares to Ghostery or Disconnect concerning privacy? In the top right of the matrix, what is "other"? Why are my rules not restored when I launched Chromium again? Why can't I save an image using contextual menu? Why does HTTP Switchboard conflict with AdBlock ? Why does HTTP Switchboard ignore my existing settings first time I install it? Why does HTTP Switchboard mess with my settings?